Hundreds of technical links without a lot of fanfare or decoration. This page is here for the benefit of all those who share similar interests. In some of these areas I have no experience (Nauru); in others I have very limited experience (aviation), and in other areas I have more experience than enthusiasm (ham radio). However I have explored the internet for information on these topics, and perhaps I can save someone else a little research time. At last count, there were 481 valid links on this page. Link checking is done periodically, and the dead links are changed to HTML comments. If I have missed a dead link, please let me know. Some of the newest items have bold titles. That was accidental, but I think I'll leave it that way. Time signals and the science of precise time and frequency measurement, including leap seconds. Numbers, random numbers, and pi. Sample Test Pattern Images: These demonstration programs and patterns are available for personal non-commercial use. The Canon FS-4000 Scanner Test Images Page includes several test patterns available for download. The Printer Resolution Test Procedures page features the ISO test pattern available as a JPEG picture, but if you were to actually buy it, you could get it here. Another test chart (requires registration, but it's not necessarily a registration chart). For my birthday, I got a Macbeth Color Checker! Image Engineering Product Catalogue . I've seen this girl before -- in a single frame of film leader. She was apparently well known to engineers at the BBC. described in great detail here." Dave Buckley is quoted as saying, "The young lady on the make-up chart was a secretary in TV Training Department (then based at Woodstock Grove, subsequently Elstree Centre where we were the first department to move in) during the 1970's. Her name was Lynn ??. I believe she was picked as she had won a Miss BBC competition. * [Further update:] Lynn came third in a Miss Great Britain contest shown on TV and this may have been the way she got the job of posing for the chart (which must have come in to use around 1976/77 at the earliest). BBC61A: An image as the lead story. One of the most popular faces in the broadcast industry, but hardly anybody knows her name. Standard Charts from Applied Image Inc.
ISO 12233 Test Chart, for which you may need an SVG Viewer. How to read the ISO 12233 Chart. QPCard: A small color reference chart. Indian Head test pattern from an old RCA TK-1C Monoscope camera. The Kozco Collection: all about the design and application of test patterns. The original artwork for the Indian Head test pattern was found in a dumpster! Update: High-quality reproductions of the Indian Head Test Pattern are now available. They have been derived from the original artwork, and they look great! Chuck Pharis really did a good bit of work restoring them. Every TV station should have an Indian Head Test Pattern in the Engineering office. Order now! The window pattern was mainly for testing DC response in video circuits. If there was any smearing in the picture, then you knew there was a problem with low-frequency response. This is the good old EIA Linearity Chart from 1961, also known as the ball chart. Update: Old glass slides from KRLD-TV are being transferred to computer-viewable form. The old test pattern looks really good. See the photos at the bottom of this page. Updated Read all about the EBS Authenticator Word List, which was standard equipment at every broadcast station, 35 years ago, along with a number of other old EBS documents. Also included, at no additional charge, is speculation on my part about some potentially annoying features to be included in the next generation of digital TV broadcasting. The Technology and Politics of Broadcasting is a page about the V-Chip, closed captioning, and the involuntary transition to HDTV. My article about Channel 37 was published in TV Technology, September 7, 2005, and has already been quoted here in its entirety. But you can also read it here and see the footnotes and illustrations. New My page about the Very Old Pictures from KRLD Radio and TV is now ready for presentation. PCI-MAX PC Transmitter / Amp: An FM transmitter that plugs into a slot in your PC, so you can broadcast your MP3 files all over the neighborhood. Of course, it's completely illegal in the U.S., but it sounds like a lot of fun. Television History — The First 75 Years: the history of TV set design, development and marketing. 8-VSB: The 8-VSB mode allows HDTV broadcasters to squeeze 19.28 Mbps of data into a 6 MHz TV channel. COFDM is used in other parts of the world, while 8-VSB is used in the U.S.
North American MPEG-2 Information with more MPEG links at the bottom of the page. United Entertainment Media: an interesting list of web sites and publications. High-Definition Television Talk: A discussion forum about all aspects of HDTV. MPEG Frame Types: An explanation of the differences between I-frames, P-frames and B-frames. Some AT&T submarine cables terminate near Bandon, Oregon. Special Holiday Feature: The lights in the hedges in front of my house are blinking holiday greetings in morse code! Morse Telegraph Keys, Paddles & Bugs. I like the looks of the Bencher Hex Paddle. Morse Code practice: an excellent resource for beginners and experts alike. Read all about my experiences with long strings of super-bright LED's! My great innovation was a method of feeding 20 milliamps of current through a group of about a dozen LED's connected in series, rather than feeding them one at a time, each through its own dropping resistor. LED Supply supplies super bright LED products by Luxeon, Cree, Nichia, and Osram. Lumileds make LED traffic signal lamps, among other things. Bright 5mm LEDs -- Surprisingly affordable. Super Bright LEDs dot com. Very bright, very cheap LEDs from China. US LED Supply: Several interesting products, mostly LED assemblies. Many consumers (like me) see nothing wrong with good old reliable incandescent bulbs, and object to the recent mandatory moves that would outlaw them. This started under President Bush ("43"), so it doesn't matter which party is in office, that's the direction we're headed if the public doesn't object. More information about compact fluorescent bulbs can be found here. I'm not a big fan, as you will see. Only very recently have LED "bulbs" shown up on store shelves, and unless you shop on the internet, the prices are still quite high, and most of the products I've seen are spotlights and accent lights rather than omnidirectional "bulbs." Drop-in replacements for ordinary light bulbs are hard to find, but there is a company called Luminosity LED offering such a device already. Again, the internet is the marketplace for merchandise on the leading edge of technology. LEDs magazine is worth a visit. The hot topic these days seems to be Luxeon LEDs. LumiLeds.com features the Luxeon III Emitter. Said to be the leader in lumens per dollar. See also Luxeon Star dot com. The Ultimate Night Vision Headlamp: 500+ lumens with only 8 watts. Really bright LEDs at All Electronics dot com. The LED Light dot com. Lighting Science Group Corporation makes LED light fixtures. Quickar is also worth a look. Why LEDs Are Everywhere: Good-bye, little red diode. Hello, spotlights! All is bright (and less costly) with LED lights. Christmas will be greener this year in a growing number of cities and shopping districts that are saving electricity by using low-energy lights in holiday displays. White LED lamp market brightens. White LEDs currently offer an efficiency of around 20 lumens (lm) per watt, which is better than incandescent light bulbs, but not high enough to compete with fluorescent lights that have an efficiency rating of from 60 to 100 lm/W. There are about 729,000 licensed hams in the US. But that number includes the licenses of a substantial number of deceased individuals, since the licenses are good for ten years. It also includes huge numbers of inactive hams like my wife and me, and people who have a license but have never been on the air, like my son. (None of us have been on the air at any time in this century.) FRS walkie-talkies do everything we need, so we got rid of our two-meter radios. Even though the tests for ham operator licenses have been dumbed down considerably, in my estimation, there are many more obstacles for the average person to avoid these days when operating a ham station. I'm not talking about tower registration or rules about RF exposure limits. I mean the wide variety of interference sources that share the radio spectrum. There are twice as many TV stations on the air today as there were 30 years ago, and probably three times as many FM stations. Not to mention cell phones, high-speed digital signals and personal computers all over the neighborhood. Ham operators generally have to accept interference without generating any, and that's not easy. Get the lead out: What would electronics be without solder? John Burke, the senior manager of Optichron, an electrical components manufacturer in Fremont, Calif., [says], "There is absolutely no evidence that there is any reason for taking lead out of solder. There was no reason to do it in the first place, the replacement is ecologically more damaging, and, by the way, the replacement is less reliable." Bibliography for Designing Lead-Free Electronics. The higher processing temperatures of lead-free solders, along with all of these new failure modes, have dramatically reduced the quality, reliability, and longevity of RoHS-compliant electronics — produced since early 2006 — versus equivalent tin/lead- based electronics that were manufactured from about 1950 through 2005. The Great Brazilian Sat-Hack Crackdown. Brazilian satellite hackers use high-performance antennas and homebrew gear to turn U.S. Navy satellites into their personal CB radios. Newspaper articles about ham radio are relatively scarce, and accurate articles are quite rare. This article is good, but most readers will be able to tell that the author doesn't have any first-hand experience with ham radio. Anti-lead laws fuel "tin-whisker" fears. They've ruined missiles, silenced communications satellites and forced nuclear-power plants to shut down. Pacemakers, consumer gadgets and a critical part of a space shuttle have fallen victim. The culprits? Tiny splinters — so-called whiskers — that sprout without warning from tin solder and finishes deep inside electronics. By some estimates, the resulting short circuits have caused up to $10 billion in damage since they first were noticed in the 1940s. Space weather has a lot to do with radio propagation. Coax cable chart compiled by A. "Kirk" Kirkwood W7GCI. Interesting: Amateur Radio License Statistics, including a long list of hams with invalid zip codes. Apparently it's possible to get a ham license even if your application shows that your Zip Code is 00000. NATO Group Releases Report on BPL. BPL, also called Power Line Telecommunications (PLT) in Europe, uses existing power lines for telecommunications with data rates higher than 1 MBit per second. NATO said that since existing power lines were not designed for such transmissions, "they will cause unintentional RF emissions which may adversely affect the established radio noise floor directly, or by cumulative propagation from many such sources. --> The Inevitable Death of Ham Radio: [The Red Cross already has] enough communications capability to more than cover themselves. ... Cell phones, mutual aid repeaters and Blackberries are replacing Ham Radio as the inter-agency communications glue. N3ZI Kits: Including what appears to be a very impressive DDS VFO. Notes on re-grinding crystals, especially to move 6.9 MHz crystals into the 40 meter band. Ham callsign prefixes around the world. Spread Spectrum Scene is a newsletter about spread spectrum products. One of my favorite tubes is the super-power 8974/X-2159. Ham Cram: What you need to pass your Amateur Radio License tests. Freq of Nature: Scanner frequencies and news items about radio-intense events in California. Change frequencies on Motorola Spirit, Sport and SP10 walkie talkies. Business and Itinerant Frequencies can make for great scanner listening around construction sites. The Cathode Ray Tube and other old electronic glassware. Electricity Around the World: Voltage, frequency and plug types for almost every country. Long ago I owned an Eico 753, which some call the worst SSB rig ever made. It was also known as the "seven drifty three." The Shure 577B looks a lot like my old favorite, the Shure 488B, which I found to be an extremely effective noise-cancelling microphone for use in high-noise environments, like my old Toyota. I could chat on the two-meter ham band with the windows rolled down and the 488B cancelled all the ambient noise. Two Meter EME Primer by Dave Blaschke, W5UN. Interesting: WA9WSJ's Antenna / Tower Page. Ham radio callsign prefixes from all over the world. Design of "PI" and "T" Network Attenuators for Inter-Stage Buffering. You can still buy 50 Watt Zener Diodes! Wilderness Emergency Medical Services Institute has a big page of interesting stuff related to disaster management, emergency communications, storm spotting, and other stuff about survival in rural areas. History of American Broadcasting AM, FM and TV. Interesting. 378 Stations which were on the air as of June 30, 1922. One of my favorite old tubes was the 892R. The anode radiator on this tube is a cluster of copper fins that weighs 41 pounds. but until recently I had never seen a water cooled 892. This data sheet shows both varieties. Another variation was the GL892, good only to 1.6 megacycles. Nortex Electronic Co. in Fort Worth has recently closed, due to the death of the 84-year-old proprietor, Lewis E. Cearly. Lewis was a cool old man. Both he and his store / museum will be greatly missed by a number of people including myself. In Memory of Lewis E. Cearly Jr., Proprietor. Here is a good photo of a 4-1000. Numerous power tube spec sheets. 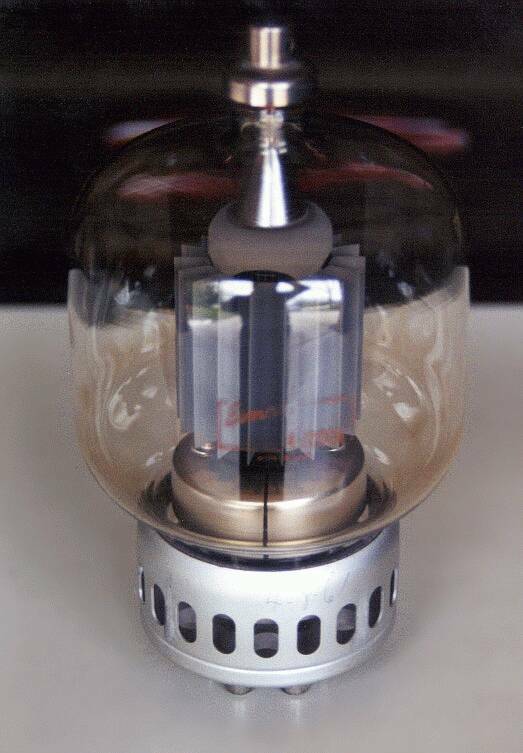 This must be the strangest vacuum tube ever: A single tube functions as a three-phase full-wave mercury arc rectifier. Transmit Audio with a Laser Pen. Convoy! Originally, a license was required for Citizens' Band radio, but masses of people simply broke the law and operated without a license until the FCC was forced to bow to reality. Citizens' Band radio became popular because of widespread resistance to the unpopular 55-mile-per-hour speed limit. Editor's Note: I knew only a few people who were into CB radio before 1974. One of them was my Driver Education teacher (in the summer of 1970) who was very careful to obey all the rules about proper identification and so on. It was only when the 55 mph speed limit went into effect that 11 meters really became known as the "Criminal Band", and things like licensing and station identification and power limits were universally ignored. For information about "numbers stations", see Page Two. Borrow a shortwave radio for 30 seconds. New: DX Tuners — Numerous shortwave receivers available in various parts of the world. DX-Listeners' Club, Norway Monitors trans-Atlantic DX on 1470 kHz nightly. The sounds of shortwave radio. Even more shortwave sounds, especially digital data sound samples. Worldwide lightning map, apparently real-time or close to it. Clam Lake Facility (PDF) The Navy operates an ELF transmitter system at 76 Hertz (!) in Wisconsin. New: ZEVS, The Russian 82 Hz ELF Transmitter. This web site specializes in VLF radio, 22 kHz and down. US in trouble over baby babble. The US military is in trouble in Japan — but this time it's not low-flying fighter jets or misbehaving Marines who are ruffling feathers, but infant babble transmitted over illicit baby monitors. Japan's Internal Affairs and Communications Ministry has warned the 47,000 US forces based in the country that the devices used by service personnel with young children interfere with local radio frequencies. The Global Maritime Distress and Safety System is a system based on the linking of Search and Rescue (SAR) authorities ashore with shipping in the immediate vicinity of a vessel in distress or in need of assistance. My GMDSS Operator/Maintainer license was issued on June 23, 2005. It looks very much like a ham radio license. (Pictures at the bottom of this page.) A search of the FCC database [on 6/23/2005] shows that there are currently 5201 GMDSS Operator licenses, 404 GMDSS Maintainer licenses, and 377 GMDSS Operator/Maintainer licenses. GMDSS replaces the old Morse code system for maritime distress messages and other urgent traffic. The FCC database shows that there are currently 1919 active (unexpired) Radiotelegraph Operator licenses, but this number is sure to steadily decrease. As far as I have been able to determine, everyone who holds a Radiotelegraph Operator license also has a ham radio license. New! I have just finished two pages dedicated to a little-known FCC document from 1958 about the construction of Beverage antennas. This document is hard to find, and once you find it, it's hard to read. So, as a public service, I have manually transcribed the entire thing into HTML. (Attempts to use OCR programs resulted in nothing but gibberish, so I had to do it the hard way.) The pages of the original are here but the new HTML version is here. Beverage antennas – some practical views. Notes on Beverage Antenna Construction. You're not really a radio engineer unless you understand Smith charts! Balanced Transmission Lines in Current Amateur Practice [PDF]. You can get a really nice balun if you spend some money. Flexweave wire is available here. Conductive Anti-oxidants come in handy when making wire-nut connections. Georgia Copper: Copper straps, sheets, mesh (screen), even copper nails. About TV and FM Antennas: TV and FM Antenna Tips, FAQ, Reception Help, Interference and Amplifier Guide, etc. Crazy Enough to Build Your Own TV Antenna? Antennas.US: a Florida firm specializing in all types of antennas and communications electronics — all made in the USA. Definitely worth a visit. Wind your own 50-to-470 Ohm transformer for Beverage antennas. If you're winding your own coils, you'll probably end up on Page 85 of the Ocean State Electronics catalog. Why is 50 Coaxial Line so Special Anyway? A mathematical analysis of power handling versus attenuation in coax lines. Lots of calculus is involved, including a couple of symbols I've never seen before, but the bottom line is quite understandable. Numerous pictures of towers and transmitters. Glen Martin Engineering: Towers and communications support structures, including cell phone towers that look like pine trees or flagpoles! You may have stumbled across this web page while searching for someone who mentions the Cesium resonance frequency of 9192631770 Hz. As far as I know, nobody has mentioned that the nearest prime number is 9192631793. This just in: NIST Unveils Chip-Scale Atomic Clock: The heart of a minuscule atomic clock – believed to be 100 times smaller than any other atomic clock – has been demonstrated by scientists at NIST, opening the door to atomically precise timekeeping in portable, battery-powered devices for secure wireless communications, more precise navigation and other applications. Turn your oscilloscope into an analog clock. Amateur Time Hackers Play With Atomic Clocks at Home. Tom Van Baak's spare upstairs bedroom looks like a cross between the control center of a remote polar outpost and the inner sanctum of a Victorian mad scientist. In reality, it's a home-built lab dedicated to the study of time. One wall is stacked with a small museum's worth of old nautical clocks, thin slabs of quartz, vacuum tubes of unknown purpose and a few metronomes. Daylight saving time needs to be abolished. Here we go again with our annual exercise in silliness. At 2 a.m. Sunday [11/4/2018] the absurdity known as daylight saving time ends. Unless you live in Arizona or Hawaii — the only two states where daylight saving time is not observed — you will need to turn your clocks back an hour, gaining the hour you lost when clocks moved forward March 11. You also don't need to worry about changing your clocks if you live in the U.S. territories of American Samoa, Guam, Puerto Rico, and the Virgin Islands. But there's not much time left to relocate there to escape the mandatory time travel the rest of must endure. Sun setting on daylight saving time? States consider alternative to clock-changing 'hassle'. Lawmakers in 10 states have proposed legislation challenging what, for many, is a twice-a-year headache, and one they just endured again earlier this month. The new bills would mostly have states pick a time ... and stay on that time. "Every time you have the spring forward or fall back, you get in the coffee shops, churches and everybody's complaining about it and all of a sudden it dawned on me it is kind of a hassle," said Texas state Rep. Dan Flynn, who proposed a bill that would place the entire state of Texas on central standard time year-round. Also in the news: Indiana adopts Daylight Savings Time statewide. Indiana's governor on Friday [5/13/2005] signed a law that will make the entire state recognize Daylight Savings Time next year but whether the state will declare itself in the Central or Eastern time zones is still up in the air. Daylight Saving Change: Energy Boon or Waste of Time? At 2 a.m. on March 11 the United States will spring forward three weeks earlier than usual, as the country implements the first change to its time standards since 1986. In 2005 Congress passed a mammoth new energy bill that includes a controversial month-long extension of daylight saving time. Daylight Saving Time Facts: Contrary to popular belief, no federal rule mandates that states or territories observe daylight saving time. Most U.S. residents set their clocks one hour forward in spring and one hour back in fall. But people in Hawaii and most of Arizona — along with the U.S. territories of Puerto Rico, American Samoa, and the Virgin Islands — will do nothing. The great daylight saving scam. Four years ago, Congress in its infinite wisdom extended daylight saving time (DST) by a month, with the goal of saving energy. Lots of energy. The bill's champion, Rep. Edward J. Markey, Massachusetts Democrat, said it would save consumers a generous $4.4 billion over 15 years. Of course, Mr. Markey was just repeating what has long been an established truism among policymakers: Setting the clocks forward in the spring saves energy because people don't have to turn their lights on as much as at night. Just one problem. While daylight saving time might "save" daylight, it doesn't appear to save energy. In fact, it very well might do the opposite. Railroads pushed the uniformity in time across the United States in the late 1880s. "Welcome to Cleveland!" a train conductor may have told passengers in 1890. "Set your watches ahead 33 minutes!" Travelers from Cincinnati, however, would have been advised to move up 11 minutes. And anyone planning to catch another train would have been warned to keep their own time and ignore the clocks of Cleveland. ... It didn't matter until railroads started covering greater distances at faster speeds. On Time: How America Has Learned to Live by the Clock: An Exhibition at the National Museum of American History. List of time signal stations with an emphasis on Russian VLF stations. Lists of LF and HF time and frequency stations are embedded in "GPS receiver using a radio signal for improving time to first fix", United States Patent 5663735. To see how the NIST and USNO atomic clocks compare to the standards used in other countries, you should consult the latest issue of BIPM Circular T.
Two-way satellite time transfer uses either Horizons 2, or Galaxy 17. "Pardon Me, Soldier, but Would You Happen to Have the Atomic Time?" "If GPS is disrupted or jammed, a CSAC could provide precise time to the GPS receiver to enable rapid recovery or to protect receivers from GPS spoofing, a condition where false GPS signals are broadcast to fool GPS receivers with erroneous information. The hope is that the Soldier wouldn't even know that his GPS is being jammed." USNO Clock Vault, Washington, DC. Photo: Cesium-beam atomic clocks at the U.S. Naval Observatory, 1984. Atomic clocks like these ones at the Naval Observatory are the basis for establishing coordinated universal time (UTC), the most precise measurement of time used worldwide. The Naval Observatory, in Washington, D.C., maintains a master clock based on readings from more than 60 atomic clocks. USNO Alternate Master Clock. Although the purpose of the AMC is to provide precise time in the event of a catastrophic failure of the USNO Master Clock in Washington, DC, its role has expanded to include providing precise time to the Global Positioning System operated from Schriever AFB. I used to listen to YVTO in Caracas, Venezuela, when they were on 6100 kHz. Spooky Atomic Clocks: NASA-supported researchers hope to improve high-precision clocks by entangling their atoms. You've Got 25 Years Until UNIX Time Overflows. The problem springs from the use of a 32-bit signed integer to store a time value, as a number of seconds since 00:00:00 UTC on Thursday, 1 January 1970, a practice begun in early UNIX systems with the standard C library data structure time_t. On January 19, 2038, at 03:14:08 UTC that integer will overflow. It's not difficult to come up with cases where the problem could be real today. Imagine a mortgage amortization program projecting payments out into the future for a 30-year mortgage. The USNO provides time checks via dial-up modem, at 1200 baud, 8N1 only. ...and there's also the ACTS system at up to 9600 baud, 8N1. Be sure to visit NTP.org, home of the Network Time Protocol (NTP) project. An explanation of Simple Network Time Protocol (SNTP) Version 4. NTP Time Servers and NTP wall clocks. Another nice-looking Stratum 1 NTP time server. TimeTools is a company that makes NTP Synchronised Ethernet Wall Clocks among other things. including Atomic Time Synchronizer and HiClock Pro. One-shot no-frills time check from USNO. (719) 567-6742 USNO, Colorado Springs, CO.
(900) 410-8463 U.S. Naval Observatory - distributed exclusively by landlines to prevent satellite delay. ...and in South Africa: (012)-349-1576 and (012)-349-1577. About 45 years ago, I heard that you could call any U.S. Air Force Base and ask for Extension 3303, and you'd be connected to a WWV receiver. (Does anyone else remember that?) It worked on the one occasion I tried it, in about 1969. Jane Barbe, the voice heard round the world. The Time Lady: Jane Barbe has one of the most recognizable voices in the world. Before Audichron: A time operator at her post. Sidebar discussion: I got interested in ham radio (and the study of the precise time-of-day) back in 1967 because of WWV. I had tampered with my new transistor radio in a successful attempt to move it into the shortwave bands, and I ran across WWV, probably on 2500 kHz. Back then, WWV was identified in Morse Code every five minutes. After learning the code, I got into ham radio, and the rest of that story is illustrated here if you're interested. For what it's worth, federal law 15 USC §260: The Secretary of Transportation is authorized and directed to foster and promote widespread and uniform adoption and observance of the same standard of time within and throughout each standard time zone. Apparently this means that you're legally obligated to observe the correct time of day if you transact business. (I've heard that federal contracting officers are required to keep track of the time (when bidding closes on a contract) through the Naval Observatory, just to be sure they're right about the time of day. Cool ! The Totally Accurate Clock (Kit) extracts precise time from GPS    The CNS Clock is essentially the same thing, fully assembled, with TAC32 Software. New: GPS Based Time Sources at the microsecond level, mainly for astronomers. The AVR Card microcontroller core module seems like a Basic Stamp, but much more powerful. This AVR based GPS Receiver page was the first place I heard of an AVR module. Recommended reading: Low-Cost High-Accuracy GPS Timing (PDF document) This is an article about the extraction of precise time (down to a few nanoseconds) and tremendous frequency stability from GPS for radio astronomy purposes. Manufacturers of Time and Frequency Receivers: the NIST list. The Z3801A and Z3816A are high quality frequency/time standards now available on the surplus market. Discussion groups centered around time and frequency stuff, especially the Z3801A GPS Receiver. Trimble makes a clone of the HP Z3801A also available at surprisingly low prices. Z3801A GPS Receiver on sale — cheap! Spectrum Instruments TM-4 seems like an interesting competitor. The Lassen LP is another small GPS timing receiver. 5071A Primary Frequency Standard This is the real thing: a cesium atomic clock. XL-DC High-Precision GPS Synchronized Time and Frequency Receiver. Atomic Time, Inc., Klockit, and others. In England, similar clocks set themselves to MSF. Japan is apparently working on the same thing, moving JG2AS to 60 kHz and changing the callsign to JJY-2. Germany's DCF77 is similar, but it is on 77.5 kHz. If you like LF radio, check out A History of Rugby Radio, which is about MSF on 60 kHz and GBR on 16 kHz. Also The Rugby Radio Station. Meridian Precision GPS Frequency Standard. Brandywine NFS-220 plus is the newest of Brandywine's GPS Synchronizing clocks and utilizes a high performance 16 channel receiver with automatic position-averaging that enables the best use of GPS when operating in a fixed location. Brandywine GPS8 Plus: Low cost, full-featured GPS Time & Frequency unit with front-panel keypad and display. Check out this MHM 2010 Active Hydrogen Maser! If you like Macromedia Shockwave, check out the Wireframe Studio. Mike's Electric Stuff has information about a variety of vacuum tubes and other things that combine glass, vacuum, and high voltages, including a whole page about Nixie tubes. Christopher Browne's Time Synchronization Page. A Brief History of Atomic Clocks at NIST: Pictures of a long series of primary time standards. I just ordered The Crystalizer, a surprisingly affordable VCXO kit. GPS Disciplined 10 MHz Oscillator constructed by James Miller G3RUH. The Præcis Ct Low-Cost Frequency and Time Standard: "Most precise time receivers require an antenna that must be installed on the roof of your building, with good sky visibility. The Præcis Cf eliminates this problem by synchronizing to within 10 microseconds of UTC by using signals broadcast from the CDMA cellular telephone system." It seems to me this would be ideal in an area with a high noise floor and lots of obstructions; for example, in downtown Dallas. Sync University - all about network synchronization. Another related topic: The Standard Meter. The U. S. Congress legalized the use of the metric system in 1866 on the basis that one meter is exactly equal to 39.37 inches. In 1959 a number of English-speaking countries agreed that an inch is exactly equal to 2.54 centimeters so that the International foot is exactly equal to 0.3048 meters. My visit to Loran-C Raymondville in 1984. Atomic clocks mark standard one-second intervals, and the date and time of each mark is assigned by some other system. When a leap second is inserted, the clocks are not stopped for one second. That's a fallacy commonly reported by the dumbed-down news media. The extra second is assigned the time of 23:59:60, and normal counting resumes at the end of the leap second. The leap second does not add one second to your life (as often reported), just as February 29 does not add a day to your life. Bulletin C 53. No leap second will be introduced at the end of December 2018. Windows 10 will get better at telling time with new leap second support. There are two main sources of time: a whole bunch of atomic clocks averaged together to produce International Atomic Time, and the astronomical time that comes from measuring how long the earth actually takes to spin on its axis. This latter time, named UTC ("coordinated universal time"), is used in science and engineering. For most purposes, it's the time reference that we want our watches, clocks, phones, and computers to be set by. Because UTC is based on the Earth's actual spinning, it slowly falls behind atomic time. Every time the gap is more than 0.9 seconds, an extra second is added to UTC — a leap second — to bring the two back in sync. The people in charge of such things don't wait for the offset to reach 0.9 seconds. The leap seconds are inserted when the difference (between UTC and UT1) is no more than about 0.6 seconds. Leap second events are planned and announced months in advance and always occur at the end of June or the end of December. How and why the leap second affected Cloudflare DNS. At midnight UTC on New Year's Day, deep inside Cloudflare's custom RRDNS software, a number went negative when it should always have been, at worst, zero. A little later this negative value caused RRDNS to panic. This panic was caught using the recover feature of the Go language. The net effect was that some DNS resolutions to some Cloudflare managed web properties failed. The problem only affected customers who use CNAME DNS records with Cloudflare, and only affected a small number of machines across Cloudflare's 102 data centers. At peak approximately 0.2% of DNS queries to Cloudflare were affected and less than 1% of all HTTP requests to Cloudflare encountered an error. Re: Cloudflare explains the leap second bug. There is really no excuse for Cloudflare's problem with the recent leap-second. In 1969 and for many years afterward, I worked on computer software that handled leap-seconds correctly. All we needed was about 2 month's advance notice that a leap-second would occur; today, such notices are available much more than 2 months in advance. [...] Cloudflare is not alone in having software developed by individuals who have little knowledge about the dynamics of time. The problem of careless (ignorant?) programmers is even promoting plans to eliminate leap-seconds, which would mean a gradual (but generally unnoticeable in a human lifetime) shift in the times of sunrise, sunset, and tides. Amazon finds its own way around leap second problem — by skewing time instead. Amazon will be dodging the usual solution to the problems presented by the world's next leap second, ditching civil time for 24 hours and creating its own version of time. [...] Instead of adding a second on June 30, for 12 hours on each side of the leap second, the company will stretch out each second in AWS clocks to "1+1/86400 seconds of 'real' time", Barr added. That means for a 24 hour period, Amazon will enter its own time and fall out of synch with Universal Coordinated Time (UTC) by as much as half a second. How Computers Will Deal with 2016's Leap Second by "Smearing Time". [Scroll down] This isn't a brand new idea. Google's first came up with it in 2008, and other companies in similar positions have tried variations, though the specifics vary. For the 2015 leap second, Amazon Web Services slowed its clocks by 1/86400 (.001157407%) for a day before the jump, smearing the extra second over the preceding 24 hours so its clocks would be one second slow at the time of the one-second jump. Another cloud company, Akamai, is doing the same thing this year, using a 24-hour smear. Google's 20-hour smear is an outlier, but not due to any illusions that this method is superior. As Google's developer page notes, the choice is to make things easy on Google's existing infrastructure, and the company proposes that everyone adopt a standard noon-to-noon, 24-hour smear, with the leap second dead center, instead of on the end. What's A Leap Second? Every now and then a leap second is added to Coordinated Universal Time (UTC) in order to synchronize clocks worldwide with the Earth's ever slowing rotation. This year's Y2K: 'Leap second' threatens to break the Internet. The problem is that the computer software controlling much of the Web doesn't play nicely with leap seconds. The previous leap second, which took place in 2012, brought down Reddit, Yelp (YELP), LinkedIn (LNKD, Tech30), FourSquare, Gawker and StumbleUpon, among other sites and apps. Qantas' entire computer system went down for hours, forcing employees to check in passengers by hand. The code for most Web apps is based on Unix, software that traces its roots to 1970 — two years before leap seconds ever existed. This New Atomic Clock Is So Precise Our Ability to Measure Gravity Constrains Its Accuracy. "The level of clock performance being reported is such that we don't actually know how to account for it well enough to support the level of performance the clock achieves," Andrew Ludlow, a physicist at NIST and the project lead on the organization's new atomic clock, told me on the phone. "Right now the state of the art techniques aren't quite good enough so we're limited by how well we understand gravity on different parts of the Earth." Before diving into the nitty gritty of what Ludlow and his colleagues at NIST have accomplished, however, it will help to have some background on the nature of time and atomic clocks. IERS Bulletin C. NO leap second will be introduced at the end of December 2012. [...] Bulletin C is mailed every six months, either to announce a time step in UTC, or to confirm that there will be no time step at the next possible date. As world preps for 'leap second' on June 30, Google says it's ready. Search giant Google says that its systems are ready for the 'leap second' that the world will experience on June 30, 2015. Described as a sort of tiny leap year, a leap second lets the earth's rotation catch up with atomic time, according to the Times of India. June's will be the 26th recorded leap second, and the third since Google was founded in 1998. "By convention, leap seconds happen at the end of either June or December," the search giant explained in a blog post. "Leap second" bugs take out some prominent websites. It was a rough weekend for the internet. While Friday's problems with Amazon Web Services and other sites could be chalked up to some wicked thunderstorms, several sites went down Saturday for periods of time thanks to problems with the "leap second." 'Leap second' to be added Saturday to keep pace with Earth's rotation. International timekeepers are adding a second to the clock at midnight universal time Saturday, June 30, going into July 1. That's 8 p.m. EDT Saturday. Universal time will be 11:59:59 and then the unusual reading of 11:59:60 before it hits midnight. Some explanations of leap seconds (in the newspapers) are more accurate than others. The one immediately above was very good. Leap second: June 30 to be longer than other days. To keep atomic clocks in line with the Earth, June 30 will get an extra second tacked on at the end of the day. 'Leap Second' Bug Wreaks Havoc Across Web. On Saturday, at midnight Greenwich Mean Time, as June turned into July, the Earth's official time keepers held their clocks back by a single second in order to keep them in sync with the planet's daily rotation, and according to reports from across the web, some of the net's fundamental software platforms — including the Linux operating system and the Java application platform — were unable to cope with the extra second. Leap seconds explained in Australian English. Time Scale Data Archive: List of leap seconds, link to current UT1-UTC values. Archive of daily UT1-UTC values. Calculate days between dates. For example, I'll be 20,000 days old in a couple of months. Another excuse to go out to eat. The Time Now: Time-related features with enhanced accessibility. 2008 to be extended by one second. Those eager to see 2008 come to a close will have to wait a second longer. A single leap second will be added at the end of the year to accommodate a subtle slow-down in the Earth's rotation. Tick tock ... tick: Extra second added to 2008. Among the reasons for Earth's slowing whirl on its axis are the braking action of tides, snow or the lack of it at the polar ice caps, solar wind, space dust and magnetic storms, according to the U.S. Commerce Department's National Institute of Standards and Technology, another timekeeper. By contrast, a leap day, February 29, occurs once every four years because a complete turn around the sun -- our year with all its seasons -- takes about 365 days and six hours. IERS Rapid Service/Prediction Center for Earth Orientation Parameters. What is Earth Orientation? There are various factors which cause the orientation of the Earth to change with time. Polar motion is caused, in part, by large scale movements of water and changes in the atmospheric angular momentum. For example, the yearly melting of snow and ice in northern Spring contributes to the annual term of polar motion. It is also thought that large earthquakes and the embayment of water by dams and reservoirs might affect polar motion, but this has yet to be quantitatively demonstrated. Chile quake may have tipped Earth's axis. The massive earthquake that struck Chile on Saturday may have shifted Earth's axis and created shorter days, scientists at NASA say. The change is negligible, but permanent: Each day should be 1.26 microseconds shorter, according to preliminary calculations. Offsets and step adjustments of UTC. Find today's MJD: click on "Valider". Japan Earthquake Shortened Days, Increased Earth's Wobble. Earth naturally wobbles slightly as it spins, because shifting surface mass such as melting glaciers and moving ocean currents can throw the planet off balance. Data from high-precision GPS instruments show that parts of Japan shifted by as much as 13 feet (4 meters) as the fault plates lurched due to the earthquake. This allowed scientists to calculate how much Earth's overall mass distribution had shifted and thus how much the wobble was affected. The shifting mass also affected the planet's spin rate, according to geophysicist Richard Gross, of NASA's Jet Propulsion Laboratory in Pasadena, California. The One-second War. As more and more systems care about time at the second and sub-second level, finding a lasting solution to the leap seconds problem is becoming increasingly urgent. This is a roundabout way of saying the Windows Time service makes no provision for leap seconds. How the Windows Time service treats a leap second: After the leap second occurs, the NTP client that is running Windows Time service is one second faster than the actual time. This difference is resolved at the next time synchronization. Countries consider time out on the 'leap second'. It's high noon for the humble leap second. Horita, maker of the only GPS Based Video Sync Generator of which I am aware. Update: There is another one - the Evertz 5600MSC GPS-based sync generator. Of course CNS, Motorola, HP, Trimble and Stanford Research Systems are mentioned above. Time and Date: Clocks, calendars, days between dates, etc. Worldtime: Shows day and night on a globe in real time, custom configuration. Besides time and frequency, there are Other standards around the world like bar codes, paper sizes, and country codes. Tweaking Toolbox for Windows, similar to the Windows 98 version of TweakUI. HEXpert for Windows: Windows multi-format binary editor. Edit Pad: A really good text editor; much better than NotePad, I think. For more information about undeleting files, please see Deleted Files Can be Recovered. Cell phones: Use, misuse, and electronic countermeasures. Complete list of telephone area codes from the North American Numbering Plan Administration. Area Code Listing, by Number. Area code maps for all 50 states. NANPA Reports is an interesting page if you're into area codes. Find the Location of a Caller. Find the Wireless Exchanges in an Area Code. Another complete list of area codes (alphabetical). There are 25 area codes in Texas. I remember when there were only six. The explosion of phone numbers occurred because every fax machine, cell phone, voice mail box and pager has its own number, and every 15-year-old kid in town has a cell phone. Many medium-sized businesses no longer have switchboard operators; they have PBX's so you can dial any extension directly. And phone numbers are (apparently) assigned in blocks of 10,000 to various phone companies. If I were to guess, I would say Fort Worth is the largest city in the U.S. which has not undergone a change of area codes. Or possibly El Paso. The first digit of an area code is never 0 or 1, and the second digit is never 9. Technical information about telephones and the telephone system. New! Area Code Locator for North America, along with a page of area code news. AreaCode.org is an area codes locator and comprehensive directory of area codes across the United States. Country codes for international phone calls. Area code 710 has been reserved for the United States Government, although no lines - other than the single telephone number 710-627-4387 ("NCS-GETS") - had actually been connected on this code as of 2004* and even that number requires a special access code to use. * GETS stands for the Government Emergency Telecommunications Service, which is described in some detail here. The Evolution of the Area Code. I want to tell you about the controversy the Bell System's embrace of numeracy provoked — how resentful some people became when their familiar method of making phone calls was taken from them. I want to tell you about why the change was necessary, and how it still informs our conception of phone calls and text messages. I want to tell you about the future of the phone number. Technology Facilitates Caller ID Spoofing. In the last few years, Caller ID spoofing has become much easier. Millions of people have Internet telephone equipment that can be set to make any number appear on a Caller ID system. And several Web sites have sprung up to provide Caller ID spoofing services, eliminating the need for any special hardware. Spoofing scams make caller ID untrustworthy. Spoofing makes use of services that allow callers to disguise the number they are calling from. ... The service is legal, and spoofing companies point out that even law enforcement agencies use it as an investigative tool. Bill Would Outlaw Caller ID Spoofing. Five years in prison if performed for commercial gain. MPs urge action as spooky caller ID-faking services hit UK. Communications watchdogs have today been pressed by MPs to investigate a new service that allows people to fool caller ID systems into displaying a fake number, amid fears it will be abused by ID fraudsters and other conmen. It's thought such trickery is currently legal in the UK. So-called caller ID spoofing services have been available in the US for several years. is susceptible to fraud. Using a practice known as "caller ID spoofing," disreputable parties can deliberately falsify the telephone number relayed as the Caller ID number to disguise the identity and originator of the call. Comcast warns of *72 phone-forwarding scam. The fraud involves an inmate calling a person collect and tricking the victim into forwarding his phone to another number. The person at the other number then can make hundreds of dollars in long distance calls that are billed to the victim's phone. Pay phones fade away at AT&T. The phone booth is a relic of an age nearly gone by. On Monday [12/3/2007], the venerable AT&T announced plans to phase out its pay-phone business by the end of 2008. The move affects AT&T pay phones in its traditional 13-state service area. BellSouth, acquired by AT&T in 2006, had previously exited the business. 150,000 watch North Korean factory boss executed for 'making international calls'. A North Korean factory boss accused of making international phone calls was executed by a firing squad in front of 150,000 people. [North Korea's] citizens are banned from communicating with the outside world, part of the regime's authoritarian policies seeking to prevent any challenge to the iron-fisted rule of Kim Jong Il. Verizon phones make an audible alarm when 911 is dialed. Just the thing for those hostage and robbery situations — I don't think: "The alarm is not ear-splitting, but it is loud enough to be heard at least several yards away." Verizon claims the FCC requires this. The FCC says it's not that stupid. New York Town Kills Cell Tower. In a move that broadband advocates fear is part of an increasing trend, a small grassroots group forced the town government in the Westchester County suburb of Lewisboro, New York to back out of a deal with the governing board of a local church that had agreed to serve as a site for a cellular tower. The antenna would have been mounted inside the church's steeple, making it rise about 50 feet higher into the air, and would have been invisible to the surrounding area, which had long been prone to dropped calls and dead zones. It's too bad that all three sides couldn't lose. Here we have a church that is willing to prostitute its steeple as a cell phone site. The church is hoping to profit by accomodating the people who can't bear to live without continuous cell phone contact. Then there are the "community" busybodies who want to meddle with other people's use of private property. They all deserve each other. T-Mobile Sues City of Olathe Over Proposed Tower. T-Mobile Central is suing the city of Olathe to allow a 60-foot tower to be built next to a church. The Gathering Place Pentecostal Holiness Church agreed to allow the cell phone company to erect the pole, as long as T-Mobile added a beam that made the tower look like a cross. But city planners objected to the plan on the grounds that it represents a sign not allowed in a residential area. Comcast outage leaves customers without TV, Internet or Phone service. Putting too many eggs in one basket can cut you off from the outside world in a hurry. Quoting from A Collection of Word Oddities and Trivia: "It was believed for a while that Edison coined the word hello, but the word has been found in print in 1826. It was used by Mark Twain in Roughing It (1872)." Also of interest: Telephone Time-of-Day. Phone trips: This guy drove all over the place recording telephone sounds. Numerous telephone company announcements, mostly error messages. Please of any broken links on this page. Page counter removed 1/4/2011 due to overflow/reset.